One of my very best friends, Sandy, is an amazing baker who can, and probably has, baked just about every cake, pie and cookie imaginable. Her cookie recipes always blow my hair back! She makes the best cookies and we have tons of fun anytime we get to bake together. Years ago she shared with me her recipe for chocolate chip cookies. Since then, I’ve made them with a few minor changes. Most notably, I make mine with whole wheat flour. 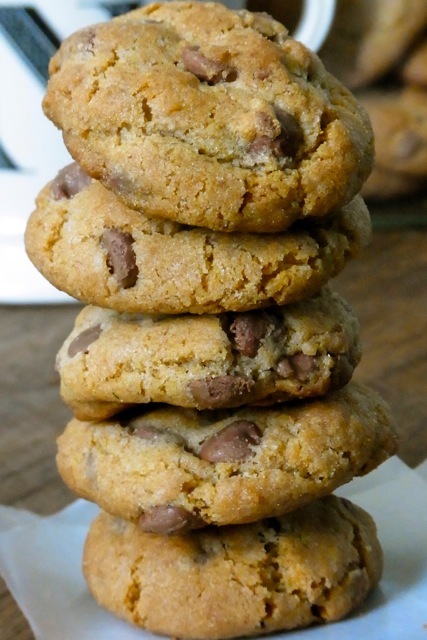 These cookies are slightly crisp on the outside and soft and chewy on the inside. I hope you give them a try and make them for some of your besties! Cream the butter, sugars and honey together in a large bowl. Next, add the vanilla and egg to the butter mixture and beat together until well incorporated. Set the mixture aside. In a separate bowl combine the flours, baking soda and salt. Using a wire whisk, combine the baking soda and salt and break any lumps in the flour. Then, add the flour mixture into the butter mixture and mix together until just combined. Then, add the chocolate chips and mix until chocolate chips have been well incorporated. Bake in the center rack of the oven for 10-12 minutes. Remove the tray from the oven and allow to cool for 3 minutes. Then remove the cookies from the tray and onto a cooling rack and repeat until you have baked off all the cookie dough. Share and enjoy!